C-Complex for Horses | Vitamin C | Mixed Bioflavonoids | Bee Pollen | Springtime, Inc.
A full spectrum of accessory nutrients to support a horse's immune system and connective tissue. A powerful vitamin C formula enhanced with bioflavonoids and nutrient rich bee pollen. Excellent for immune support, for promoting tissue, tendon and ligament health, and supports normal inflammatory response post workout. "…my mare is doing wonderful!" C-Complex is a powerful vitamin-C formula, enhanced with bioflavonoids and nutrient-rich bee pollen. Excellent for immune support, for maintaining healthy joint tissue, and for maintaining a healthy inflammatory response. C-Complex excels as a free radical scavenger, a healthy immune system supporter, capillary protector, and general health supplement. Additional ingredients make this product a truly deluxe version of the classic vitamin C standby. Recommended for antioxidant protection. Helps maintain support of immune system and connective tissue health. Give 1 scoop (¾ oz.) per 1,000 lb. body weight daily. For best results, start horses off with just sprinkle and increase gradually to full dosage. Amount may be doubled if desired. Vitamin C (ascorbic acid) has been referred to as the “master vitamin” because of the enormous range of body functions that it assists. It's no wonder vitamin C is easily the most popular supplement for people. In recent years, it has become widely accepted that the absorption and utilization of vitamin C can be optimized by “support” from the nutrients such as bioflavonoids normally occurring with it in whole natural foods. These nutrients also play direct roles in body chemistry and are themselves enhanced by vitamin C.
C-Complex is the only true, fully supported vitamin C supplement for dogs and horses on the market. Because of its powerful synergistic qualities you will find that C-Complex is more cost effective than other vitamin C products. The pollen in C-Complex is the most nutritional part of the plant. It contains a full spectrum of bioflavonoids, vitamins, minerals, enzymes, amino acids, fats, sugars, hormones and protective antioxidants. Studies have shown that pollen can remain alive and viable for 20 years or more. Citrus bioflavonoid complex, hesperidin, and rutin are all bioflavonoids that support vitamin C, making it stronger and more effective than if taken alone. Vitamin C and bioflavonoids are powerful antioxidants that protect against free radicals that can harm the body and accelerate the degenerative effects of aging. The best available citrus bioflavonoid complex comes from baby orangettes harvested at peak nutritional potency. Baby orangettes are picked fresh, immediately freeze dried whole and powdered for full spectrum nutrition. The rutin contained in C-Complex is a powerful, non-citrus bioflavonoid purified at 97%. 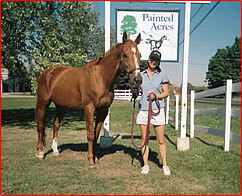 Laura with her wonderfully healthy mare, Stormy. 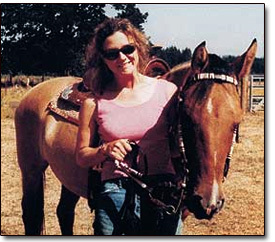 My Kiger mare was very badly damaged at a breeder's. I spoke to a friend who uses your products. I called your office and was recommended to use C-Complex. Two years later, my mare is doing wonderful! All our horses are on C-Complex! If I ever have a problem, I'll call my vet then I'll call you. After: Apollo defied the odds and is doing great! Before: Not much hope for Apollo. "I was told the horse should not have survived the amount of infection associated with his injury..."
My biggest story to you is a rescue horse that we acquired on 7/29/05. Apollo is a 14 year old Thoroughbred that had stepped on a nail while out in a pasture. Days went by before anyone noticed that his right hind leg was swollen all the way up to twice its size. The owner was no longer able to financially care for the horse, so the nail was removed and the horse was cared for the best the farm could without any veterinary care. When I saw Apollo for the first time he was so skinny and his leg was double in size with a large, open wound above his right hoof. A week or so went by and it got back to us that Apollo was going to be put down. I contacted the owner and asked her if she would consider giving me the horse. She agreed and Apollo came home. We immediately gave him medication for the swelling. A farrier that specializes in lameness heard about our horse and said that if we got x-rays done that he would take a look at them for us. On 8/12/05 I started Apollo on Spirulina Wafers along with the medication. By 8/22/05 he was up to 10 wafers per day. That is the day I got the results from the farrier. The nail had gone through the flexor tendon and shattered his navicular bone. I was told that the horse should not have survived the amount of infection associated with this injury and he certainly should not be walking. 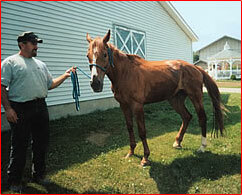 He also had laminitis in his left hind foot due to weight bearing on that leg. Both the farrier and the vets did not give me much hope for his recovery, but Apollo will tell you otherwise. His walking is almost normal on that leg. He has even trotted a few times on his good days. He has been putting weight on, and his coat and eyes look so healthy. We started him on C-Complex on 9/09/05 along with the Spirulina Wafers. We have had some minor setbacks and he still needs to be kept on medication to keep the swelling down, but, otherwise, he is doing great. I keep telling the professionals that Apollo is going to be one for their medical journals! I feel your products have a great deal to do with his recovery, along with his big heart!